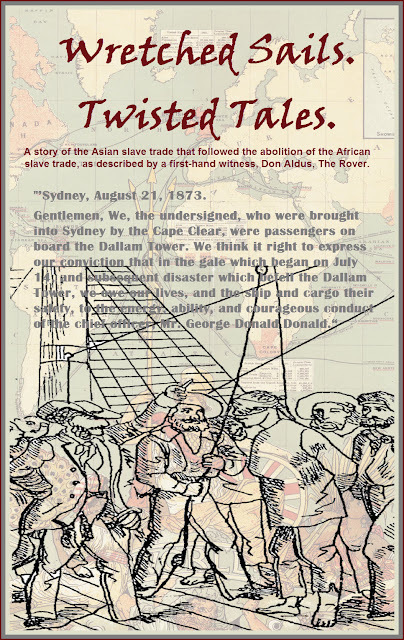 A story of the Asian slave trade that followed the abolition of the African slave trade, as described by a first-hand witness, Don Aldus, The Rover. 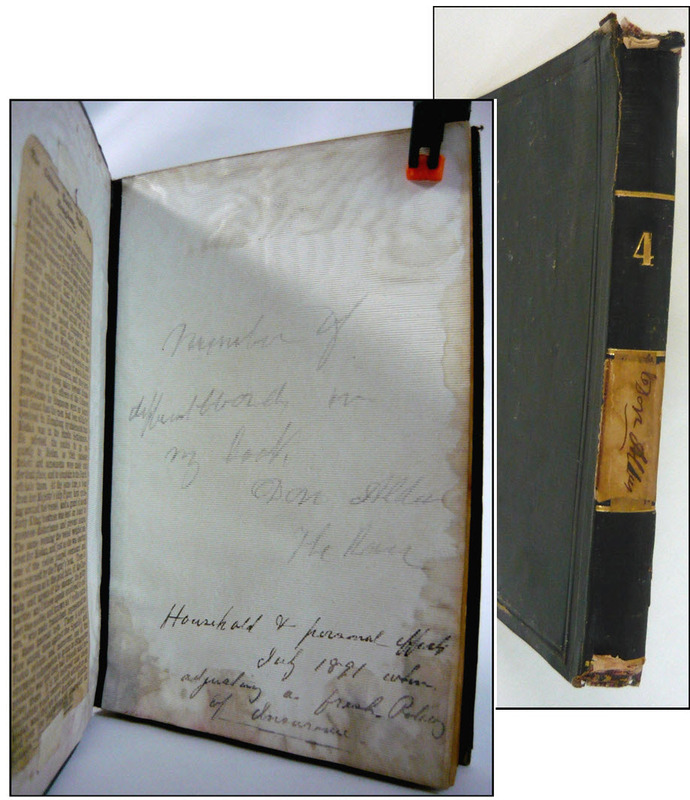 The hardbound book drifted from bookshelf to bookshelf for over 100 years before I opened it. Its water-stained pages are filled with neat columns of handwritten words organized in alphabetical lists, cryptic annotations (“Number of different words in my book, Don Aldus The Rover”) and a yellowed newspaper clipping from the London Times. Why would a writer count, for God’s sake, the words in his own book? OCD, maybe? And what was that book? Who was the mysterious Don Aldus? Figure 1 (above right): Spine of journal with handwritten and pasted label: Don Aldus. Figure 2 (below left): Inside cover of the journal. 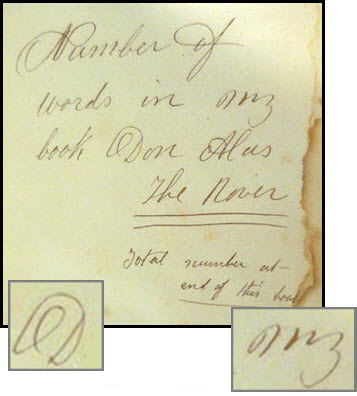 Pencil text reads: “Number of different words in my book, Don Aldus The Rover'. There were no easy answers. Little by little, question by question, it suckered me into searching for answers that no one else had found and placed in the public domain. Exactly! So what? can’t be answered unless someone investigates. My investigation crisscrossed oceans. I sniffed through the English-language archives of England and Australia, virtual library stacks in New Zealand and riffled through the genealogies of countless individuals. It is astonishing how much can be learned about historical figures using the Internet. In fact, you can sometimes learn more about them than their own contemporaries could have known. More specifically, I learned that slavery didn’t pass out of the world just because England, and later the United States, outlawed the practice. I found that racism didn’t prevent Caucasian merchants and their Chinese counterparts from doing business, as long as their mutual interests were served. I learned how hard it can be to live with shame. Plus a lot more. So pay attention. The book—let’s call it a journal—certainly didn’t look like the key to a series of interlocking stories, each known in its respective time and place, but never connected. Not like this. —The story of a ship—one of many—that freighted abducted and coerced workers from China and delivered them as slaves to the Americas and elsewhere for profit. —A long-forgotten author—our hero!—who published the same text twice in eight years, under two titles, using two names. —A scathing, seemingly on-the-spot description of the ugly and brutal coolie trade. And yet, that description turns out to be, literally and figuratively, a whitewash. What was the coolie trade? 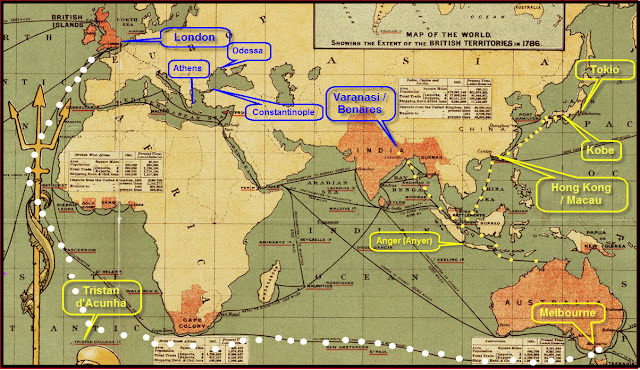 The business model essentially required the capture of Chinese nationals by other Chinese, their imprisonment in China and their subsequent transportation by ship to colonies controlled or managed by Caucasians. The contracts for this human freight were subsequently sold or auctioned, generally to mine and plantation owners in need of cheap labor. Ultimately, this journal proved to be a lost and most probably previously unknown link to reports about the coolie trade that appeared in newspapers far and wide in the latter decades of the 19th century. After the slave ships from Africa were outlawed and long before “cattle cars” were used to deliver European pariahs to German death camps, Caucasian and Oriental “businessmen” combined to obtain and deliver cargoes of miserable and horribly abused Chinese to far distant lands and godforsaken often deadly jobs for profit. The journal isn't much to look at. Some pages were cut out. Some are blank. Most are filled with lists. Neatly written, primarily in ink, the word lists are grouped alphabetically, but are otherwise casually organized. asking precedes added, which is followed by adding, and aspire. The words add up. Literally, if not figuratively. The journal’s author appears to have counted all of the words in Don Aldus The Rover. They are organized alphabetically, by first letter. Individual totals appear at the end of every section. (See Figures 3 and 7.) 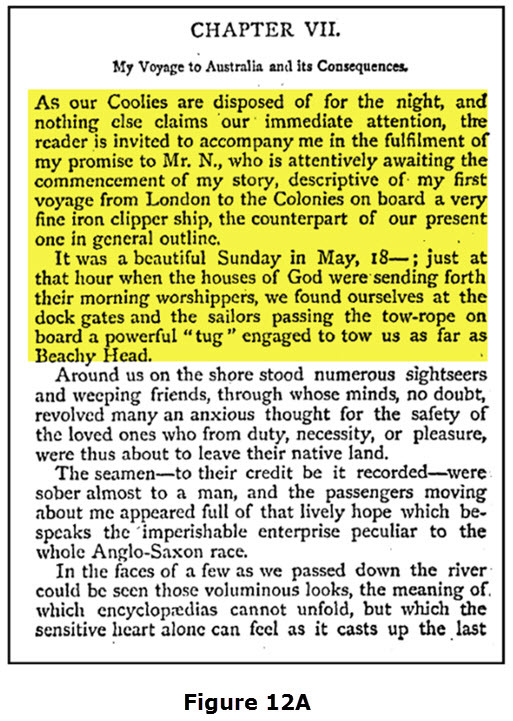 In the last pages of the journal, its author summed up a life at sea by totaling the number of words he used to describe it. This, however, would not become clear until later. The search for the identity of Don Aldus and his literary legacy ultimately led to the story of the “coolie trade” that followed the abolition of the African slave trade. I learned that the gold rush that eventually transformed the North American West had a frightful counterpart in the rush to capture and sell “yellow gold” - Chinese men - to the owners of plantations, mines and “mineral” deposits in South America, the Caribbean and the islands of the Malay Archipelago. But, as it would turn out, behind the seemingly candid testimony of Don Aldus, lay “facts” as cryptic as the water-stained journal that revealed them. I stumbled on the journal among the effects left behind by my parents. Its decorative spine earned it a second life in the disinterested safety of my parents’ bookshelves. There it likely sat unopened for years. In 1989, that house sent flames high into the sky above Mummy Mountain, in Scottsdale, Arizona. What little was left when the embers were extinguished was waterlogged or singed. The journal’s decorative value was ruined by the water that saved it. Scottsdale is a suburb of Phoenix, Arizona, planted in the Sonoran Desert. The desert is both an oddly ironic and utterly appropriate location for the discovery of a sailor’s journal. The Phoenicians of the Bible were famed mariners. Some 25 years later, I held it, looked between its covers and fell, a little like Alice in Wonderland, into another, utterly alien world. Pasted on the spine is small piece of once-cream colored paper holding the handwritten text, in ink, Don Aldus (Figure 1). It covers another piece of paper with something written on it: something presently illegible. Taped inside the cover I found a yellowed newspaper clipping (Figures 2 & 4). The headline: "The Chinese Coolie Traffic From Hongkong." It looked old; the spelling of Hong Kong was unfamiliar. Moreover, I thought that “coolie” referred specifically to Chinese laborers or servants. But I was wrong. "The word coolie, which refers to unskilled cheap labor from Asia, is believed to have its origin in India, Turkey, or Africa. A second opinion seemed in order. This article suggests that the governments of Great Britain, Germany and the Qing Chinese Emperor cooperated to ensure a peaceful, satisfactory outcome. In the then current - and clearly myopic if not simply racist - view of the newspaper, businesses and governments enabling and profiting from the transportation of shanghaied workers to an uncertain fate incurred neither moral hazard nor legal culpability. Everyone profited - except the victims. The dateline, at the end of the clipping, is "London Times, Feb.18." No year is given. A search of the London Times archive revealed that the article was published in 1890. The captain of the German steamer had good reason to be concerned. When abducted and imprisoned Chinese workers being shipped to distant foreign shores exploded into mutiny, the results for everyone on board - from the captain and crew to the prisoners - could be fearful. Contemporaneous verification is provided by a dispatch in The Colonies And India (London, Eng. ), of April 9 1890. 6 (See Figure 5.) The same information was reported widely in the American press of the time. Figure 7: The first and last journal pages (inset) listing words beginning with A. Total number of words listed for A was calculated at 467. Does the situation described sound ominous–for the coolies? It was. More ominous than you might imagine. Apparently, the journal’s author trimmed this article out of a leading English newspaper, at a time that the country was center of a vast colonial empire as of 1890. But why paste it in a journal filled largely with word lists? Like the clipping, the words were evidence, albeit, of a different type, pointing to interlocked questions. name of the author. Nor does it state how that conclusion was reached. On the facing page, in pencil (Figure 2), one sees, "Number of different words in my book, Don Aldus The Rover." Below that, in ink, there is a second, apparently unrelated entry, "Household & Personal effects July 1891 when adjusting a fresh. Policy of Insurance." Flip the page. 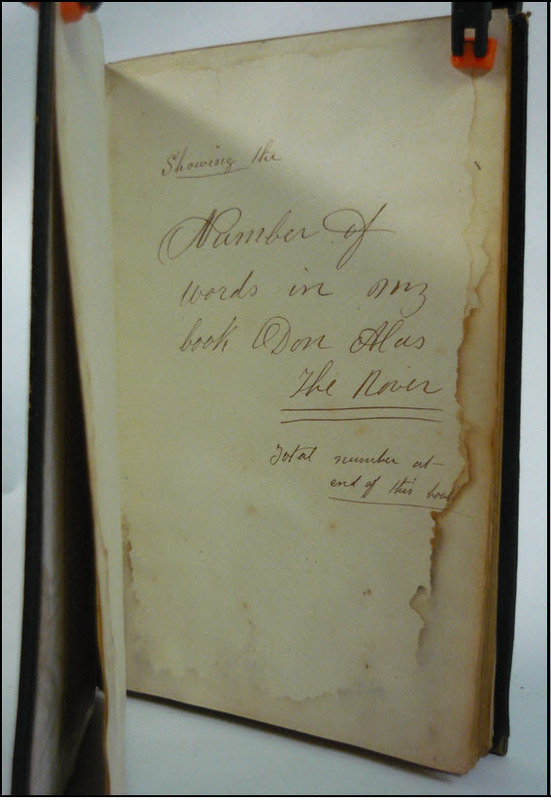 The quite legible, sepia colored ink reads, "Showing the Number of words in my book Don Al(d)us The Rover. Total number at end of this book"
–“Coolie Traffic and Kidnapping”. By Don Aldus. LONDON: McCorquodale & Co., “THE ARMOURY.” 1876. 253 pages. Collection of Oxford University. Digitizing sponsor: Google. Don Aldus! I couldn’t wait to peruse it. Figure 9: WorldCat.org listing for "Don Aldus, the Rover". Surprisingly, for a text written in the first person, Aldus’ dialog partners invariably refer to him as “Mr. D.” Don Aldus, Mr. Aldus, or Mr. A never make an appearance in the text. The second book,“Don Aldus, the Rover,” is not readily available. It was not listed for sale on AbeBooks.com or Amazon.com. The Internet Archive did not have a version, either. 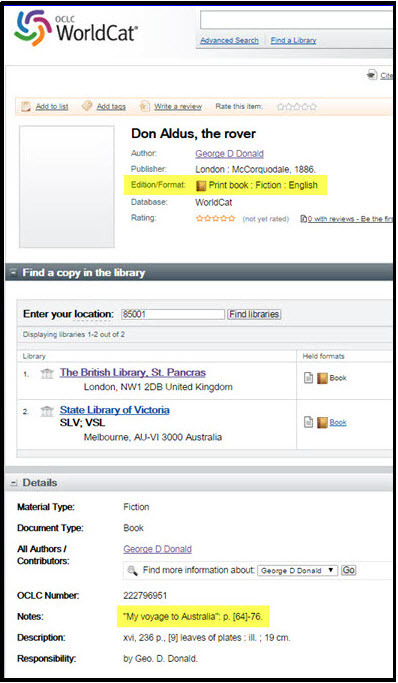 However, OCLC WordCat.com identified the location of two known copies. One is in the collection of The British Library, St. Pancras (London), the other is held by the State Library of Victoria (Australia). My curiosity aroused, I copied My voyage to Australia from the OCLC World Cat Notes entry and searched for it in "Coolie Traffic and Kidnapping." There it was: located in the Table of Contents. "My Voyage to Australia and its Consequences" (sic) is Chapter VI. It opens on page 64. Next, I picked out an unfamiliar word listed in the journal, under S: spalpeen's. Merriam-Webster.com says that SPALPEEN is a word of Irish origin and a synonym for RASCAL. But was spalpeen's used in the text of "Coolie Traffic and Kidnapping?" Bingo. It appears in the PDF text on page 36 and again, in the singular, on page 60. These two items, each an independent link to “Don Aldus, the Rover,” both appear in "Coolie Traffic and Kidnapping." The clues were suggestive. 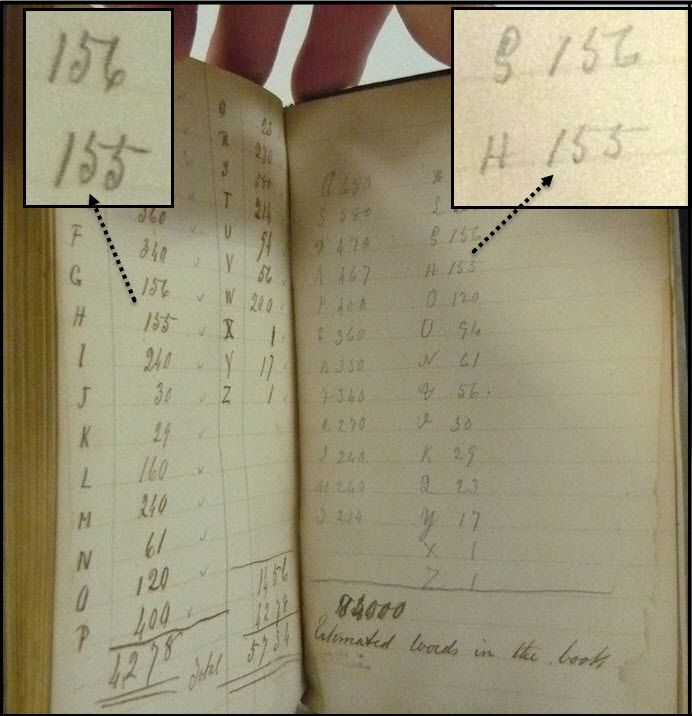 Figure 10: Journal entries near the end of the book display individual word total by letter in the text of Don Aldus, The Rover (left) and the estimated total number of words in the same book (right). The clipping from the London Times (Figure 4) also seemed significant. It was published four years after the listed publication date of “Don Aldus, the Rover.” That made it evidence of strong and continuing interest in coolie abduction on the part of the journal's author. It seems doubtful that anyone else would have pasted a pertinent newspaper clipping into the journal. Now, on a scale of nominally odd to wildly extraordinary, where does one rank the fact that the journal’s author took the time to alphabetize, write down, and total the number of individual words in an entire book? Manually. Presumably, after the book was published. The total is 5734 words. The “Estimated Words in the book,” was originally entered in ink as 43,000. That figure, however, was later overwritten in pencil with a new value, 81,000. Just how the journal’s author obtained either figure is not entirely clear. But if you copy the entire text of "Coolie Traffic and Kidnapping" into Microsoft Word and use the Word Count feature, it reports a total of 71,876 words. ● Authors Don Aldus and George D. Donald were probably the same person. Don Aldus was probably a pseudonym for George D. Donald. § Donald = Don Ald__. § Within the text of "Coolie Traffic and Kidnapping" the protagonist–presumably the author–is referred to as Mr. D.
● "Coolie Traffic and Kidnapping" and “Don Aldus, the Rover,” are probably the same book, with different titles. § Both volumes were published by McCorquodale & Co, eight years apart. § “Don Aldus, the Rover,”is not a work of fiction. ● The journal was most likely written by George D. Donald. 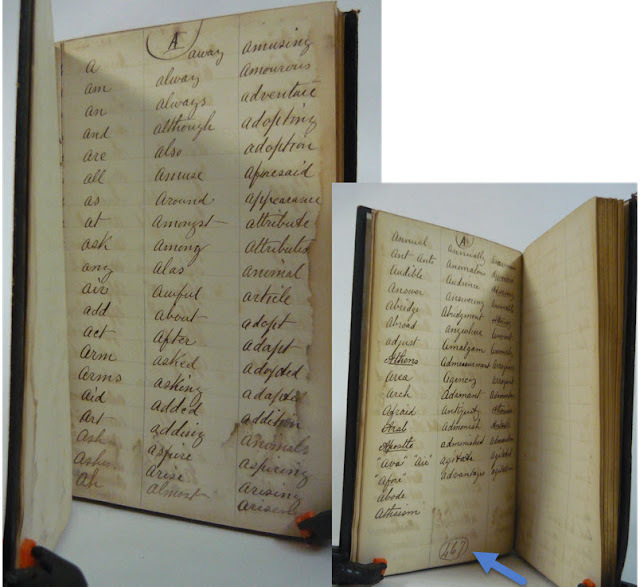 The journal shows, for example, that its author included and counted prepositions, definite and indefinite articles, even common verbs, as words: “a,” “an,” “all,” “and,” and “are.” Clearly this list was not compiled as part of any standard book index. As more data was needed. 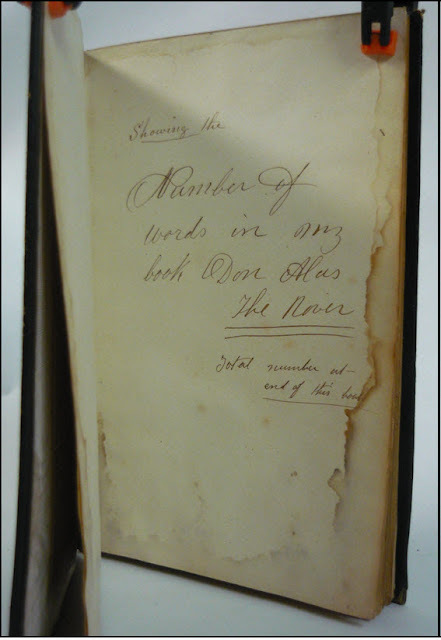 I ordered a copy of “Don Aldus, the Rover,” from the State Library of Victoria (Australia). Once it arrived, a glance sufficed. The two books are not identical. 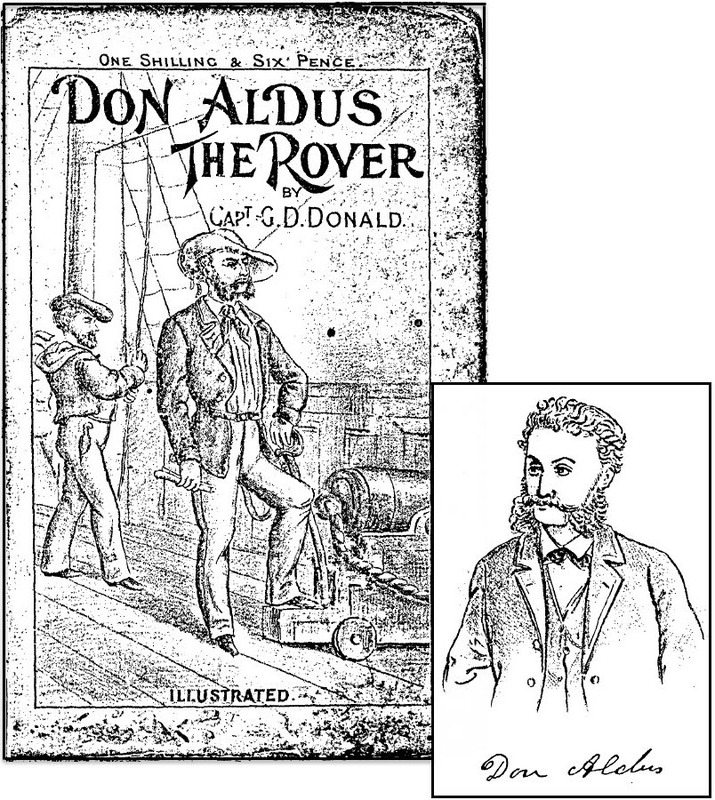 “Don Aldus, the Rover,” has a cover illustration. "Coolie Traffic and Kidnapping" doesn’t. The difference? “Don Aldus, the Rover,” has an Introduction and a new first chapter, Japan, neither of which are listed in the TOC of "Coolie Traffic and Kidnapping." 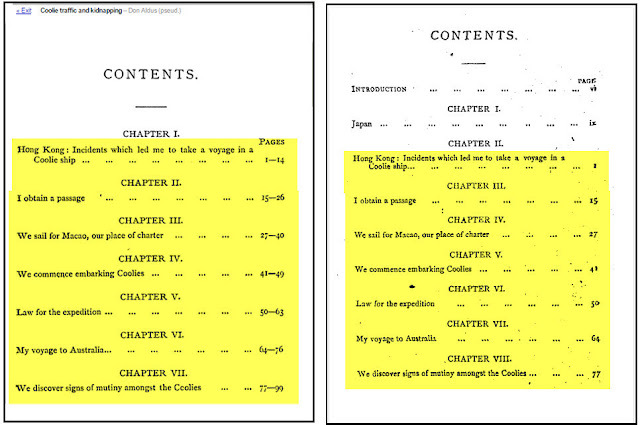 Both are paginated with Roman numerals whereas the original chapters are paginated with Arabic numerals. The font style used for the original chapters, in both TOCs, is apparently the same. The numeric range displayed for each chapter in the original text (Figure 11) has been truncated to display only the first page of the chapter in “Don Aldus, the Rover.” With the exception of the Chapter VIII., in Figure 11, even the use of the ellipses is identical. Step two was to compare pages of the “same” chapter from both books side-by-side. I picked page 3 of the chapter, "Hong Kong; Incidents which led me to take a voyage in a Coolie ship," (sic) at random. Adding the 560 words of the Introduction former and 2448 words from the new chapter, Japan, to the word count established above for "Coolie Traffic and Kidnapping" brought the total for “Don Aldus, the Rover” to 74,884 words. The error rate is right around 6%. Figure 13 (left): Cover illustration for "Don Aldus, The Rover." Published 1886. 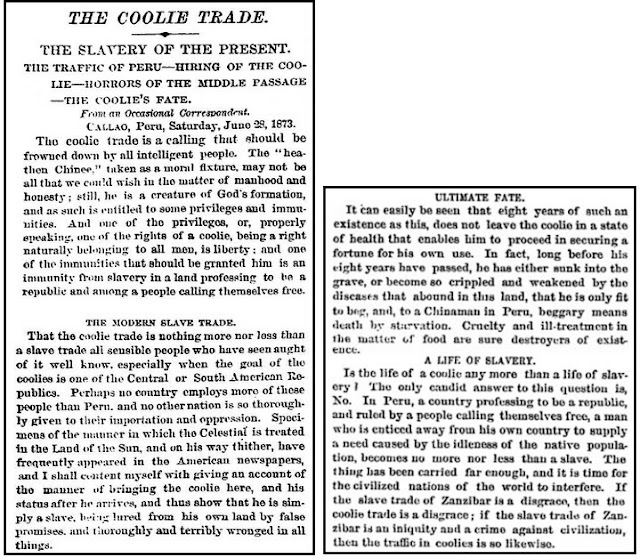 In "Coolie Traffic and Kidnapping" the emphasis in the prose Preface is on the horrifying story of human trafficking in enslaved Chinese workers. Not so in the second version. The Preface of “Don Aldus, the Rover” is, instead, poetic. It is comprised of two short stanzas of verse. The first one, “To My Critics," is an admonition not to dismiss the text before giving it a careful review. The second verse, “To My Readers,” lightly suggests that the book will amuse, instruct, or at a minimum, help pass the time. The freshly added Introduction doesn't address human trafficking, either. It speaks to other, would-be rovers and urges them to observe themselves as closely as the wide world they hope to discover. Otherwise, both books display the identical text. As noted earlier, Don Aldus never appears in the text of"Coolie Traffic and Kidnapping." Aldus does not appear “Don Aldus, the Rover” either. What is a reader to think? You buy “Don Aldus, the Rover,” it even includes an illustration of Don Aldus, but the ostensible hero never makes an appearance in the text. At least, not by name. The protagonist remains "Mr. D."
Look at the book’s cover. Isn’t that gent, hand on sword, foot on the cannon’s carriage, a ship's captain? After all, the author is listed as "CapT. George D. Donald". And the word Capt. virtually touches the gent’s hat. Now compare that image to the man identified as Don Aldus in the corresponding illustration on the flyleaf. There is, wouldn’t you agree, a close resemblance? After breakfast says Mr. D, “we came on deck to take one more look at the land ere we lost it.” A paragraph later, his tone is melancholy. This is not the reminiscence of a young man, say, an apprentice seaman. Thus speaks an adult Englishman of his first journey far from home by ship. But what experienced sailor leaves England for the first time - England, the center of a far-flung military and commercial empire connected solely by world’s oceans - as an adult? It seems unlikely. Then again, what professional seaman - what captain - tells a tale that has him unable to stand on his own two feet in heavy seas? True, not all captains are ship's captains, after all. Then again, there is no clear indication in the text that Mr. D. had served his country as a military man, either. Would an experienced English soldier or sailor describe his weapon so variably inside of six paragraphs? Or would he stick to simpler prose? Then, too, the protagonist describes himself not as a man of steely nerve and martial experience, but as a soft-hearted intellectual, certain that education would eventually cure most social ills. He has other remarkably liberal opinions, too. In any case, Mr. D, the inexperienced traveler of the chapter, "My Voyage to Australia and its Consequences," has become quite the opposite by the time he decides, impulsively, to chaperon a boat-load of coolies headed to slavery in Peru per the Preface of "Coolie Traffic and Kidnapping." He has visited Australia, China (Hong Kong), traveled the Mediterranean with stops at Athens and "Salonica" (Greece), to Constantinople (modern Istanbul, Turkey), and sailed north to Odessa (Ukraine) via the Black Sea. So Mr. D - Don Aldus? - seems to be an Englishman, aged 30 or older at the point he begins his journal. As the first book was published in 1876 - several years after it was written - Don Aldus was likely born about 1840, give or take a few years. Inconsistencies abound. 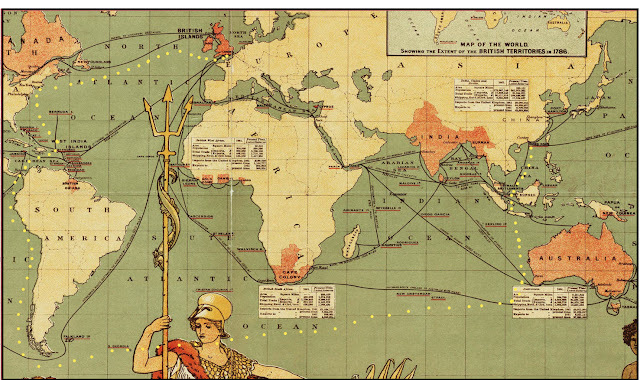 Our peripatetic protagonist, a world traveler in an age of sea travel, as noted above, describes himself as “nautically incompetent” midway through the text. ("Our passage down the China Sea." Page 130). Yet, by 1886 when “Don Aldus, the Rover” is published, its author - a Geo. D. Donald - had risen to the rank of captain. While recounting the events on his first trip away from England, Mr. D described a fateful conversation between the captain and the first mate of the ship he took to Australia in the third person. (My Voyage to Australia and its Consequences. Pages 71-72.) But he then skipped to the first person plural, as if he had been a member of crew instead of a passenger. “‘What can we do?‘ said the fellow (the captain). Apparently, McCorquodale & Co., the book’s publisher, didn’t have an editor proof the text before it was published. Our protagonist demonstrates the insights of an alert, widely travelled and equally well-read individual, even though he never mentioned his own educational background. He quotes Shakespeare. He knows enough about Chinese mythology to reference Pwann Koo, the “first man," of Chinese mythology. He is conversant with Siddartha Gautama, his place of birth and heritage. In an aside, he tosses off the approximate height of “Fusiama,” (Mount Fuji). References to Socrates, Jupiter and other classical luminaries are strewn throughout the text. Mr. D even uses a bit of French (“on dit”) and incorporates multiple handfuls of verse. This does not read like the conversation of a working stiff. Never once is the cost of his travel or accommodations worthy of mention. That summarizes Mr. D. But what can be gleaned about George D. Donald, assuming that CapT. George D. Donald was not itself a pseudonym? Why did he publish the same book twice, under different names and titles? What compelled him to use a pseudonym in the first place? For that matter, why is every person addressed by name, and each ship that Mr. D referred to, only identified by a first initial in Donald’s book(s)? Privacy? One possible answer to the preceding question is suggested by the text itself. At the outset of the book, we learn that a vessel flying the flag of England will shortly be loaded with coolies intended for the slave trade. But that was illegal! "Our naval friend immediately turned round and declared such to be impossible, as he had observed the free and proud ensign of old England flying at her flagstaff this morning, and such trade was considered almost slavery by the British powers that be, and not permitted under the flag. Isn’t it possible that the English captain of the (American-built) coolie ship, with whom Mr. D later travelled and became friendly, the crew and the ship's owners could have been targets of prosecution under English law, or other valid courts of jurisdiction in which the ship had sailed with its cargo of prisoners? Maybe, if they could be identified! For that matter the author, too, might have been subject to such laws, if he could have been identified. Conclusively identifying the author and substantiating the "facts" described in the text of Donald’s book(s) was not made easier by his purposeful omission of exact dates, ships' names and full surnames in his text(s). George and Donald being common English and Scotch names, attempting to find a particular George D. Donald, even with an estimated birth date range, was a significant challenge. I was forced to sift details in hopes of uncovering a tell-tale shard. –Mr. D departed London, England, May 18, year unknown, on a trip to the British colonies of the Far East. –He traveled by "iron clipper." –Other passengers, male and female, had also booked passage. Other clues in the text suggest that Mr. D’s Australian voyage occurred in the late 1860s or early 1870s. 1. "Coolie Traffic and Kidnapping" was published, in London, England, in 1876. 2. In the Preface of "Coolie Traffic and Kidnapping," Mr. D states that the book was written several years earlier. 3. Both books include the chapter, "We sail for Macao, our place of charter." (sic) It details the refitting a clipper ship to house a cargo of coolies, destination: Peru. Coolie trafficking out of the port city of Macau - then under Portuguese control - ended at the start of 1874. 14 Thus Mr. D’s visit clearly predated the cessation of coolie trafficking from Macau. 4. In the chapter, "My voyage through the Mediterranean" (Page 143), the author mentions seeing the Queen of Greece. "The Queen — whom I had the satisfaction to see closely — (sic) is a lovely creature of middle height, with more of the Romano-Greek than the Russ about her." Consequently, Mr. D must have departed London (prior to reaching Australia and Hong Kong) and arrived in Peru between 1867 and 1874. The next clue appeared in the form of an extended and dramatic monologue. Mr. D regales the ship’s first mate (aka, chief officer - a position subordinate only to the ship’s captain), Mr. N, with a story of his disastrous first voyage to the colonies - that is, his trip to Australia. About two months after departing London, on July 14th, 18__ a gale that battered his ship for three (eternal) days. The ship - unnamed - eventually lost all three of its masts; the passengers’ berths were flooded and the ship barely avoided sinking. 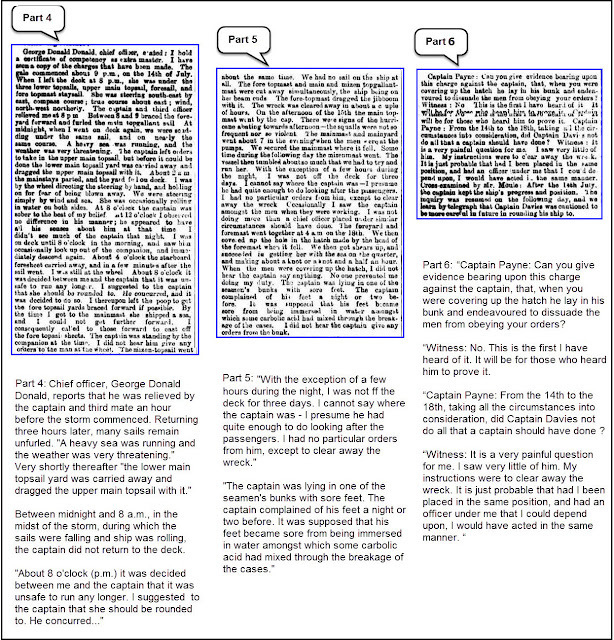 The full story required five full pages in the original text. A few key scenes follow. Ultimately, these details helped identify the exact ship in question and the presumptive author of these books. "At eight o'clock in the evening of the above date we were running before a furious storm, accompanied by fierce squalls and hail, while the sea came rolling on like living mountains, a sure sign at all times that the gale will be long and furious. "At midnight the chief officer was lashed, with two men, at the wheel, guiding the vessel before the tempest and the sea, our compass being useless, while the bold commander was moving about the saloon (endeavouring to put on a commanding countenance for the occasion) to " cheer" the excited passengers, instead of being on deck attending to the wreck of matter which had already commenced there. "We all set cheerfully to work, bailing out the water with vessels of every description, but before we got well warmed at our work she shipped another sea, swept the deck of everything, took a life-boat from the starboard quarter, and brought down the lower main topsail yard from the collar of the main stay, where it had been dangling since fifteen minutes past mid-night, bringing also the stay with it in its fall across the ship, where it broke in two, just as we were being driven — with the ladies in their night-dresses — from the inundated saloon to take what shelter the port after-cabin could afford. Speedily the saloon became a total wreck, and all our ready cash, letters of credit, valuables and clothing, battered up into a heterogeneous mass. This description summarizes only the first 12 hours of the storm. Eventually the storm and the attendant dangers abate just long enough for the sailors to lead the passengers to the other end of the ship. “Soon, however, the good ship recovered herself, in some measure at least — sufficiently to enable the sailors to convey us to the forecastle where (to our great surprise) nothing whatever had been disturbed, while all night long such sufferings were being experienced in the saloon. “The sailors immediately gave up their beds to the ladies and children, while boxes were opened and dry clothes served out to every one of us, until none remained for themselves. 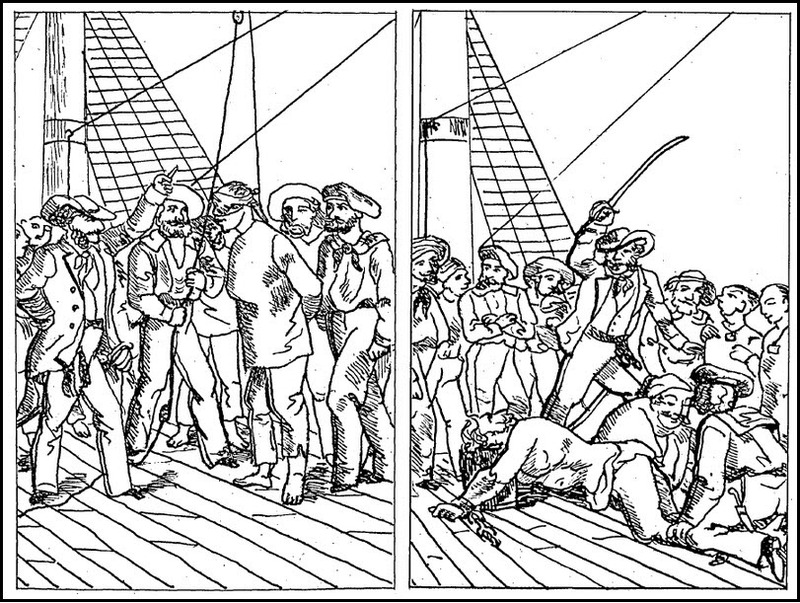 The preceding paragraphs indisputably place Mr. D on board the ship as a passenger. Although this was earlier implied, the description here is vivid and explicit. He then detailed a second night of terror. “As night closed in fervent were the prayers offered up for deliverance from further calamity. “Thick darkness shrouded every one from sight. The sea ran high; and rain had joined its battering music with the wind and measured clanking of the pumps, when suddenly a ‘crack’ was heard; the mainmast tottered and with a crash like thunder fell on board. “The falling of the mast having smashed our pump-levers, we soon prepared a primitive wooden lever to serve the purpose of pumping. “Ere the rising of another sun, the mizenmast rolled down, breaking below the poop deck, tearing and smashing everything to atoms in its track, finishing up by landing over the starboard quarter within a few feet of our steering gear." Meanwhile, all aboard - passengers and crew, men and women - are manning the pumps. Here comes the third night of the storm. “As night again drew on and darkness set its "signet on the flood" the storm if possible increased as if determined to drag the last ray of hope from every heart by howling a (seeming) sepulchral melody over us and, as it were, preparing a funeral requiem for ourselves and gallant crew. 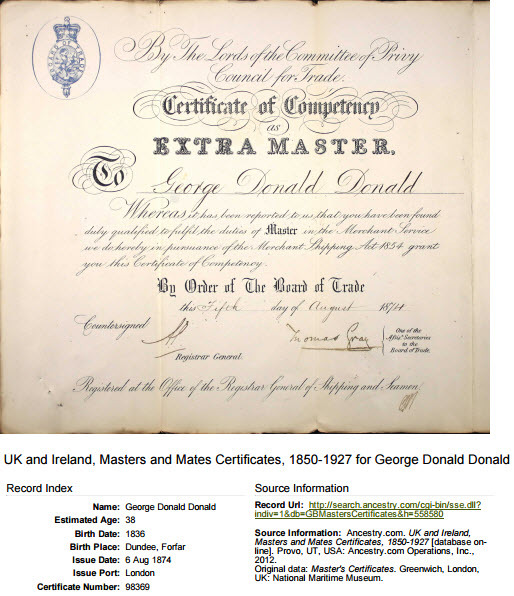 As luck would have it, in searching genealogy websites for mid-19th century England, I had earlier encountered the name George Donald Donald. That particular permutation of George + Donald and the associated dates hadn’t appeared in the archive of the Times of London, nor had Google proved helpful. But I tried again using the Elephind.com website. 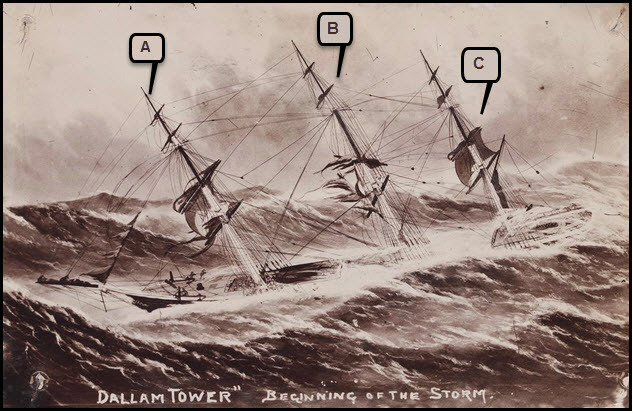 That search eventually led to articles discussing and reporting the disaster that befell a ship named the Dallam Tower. The connection? 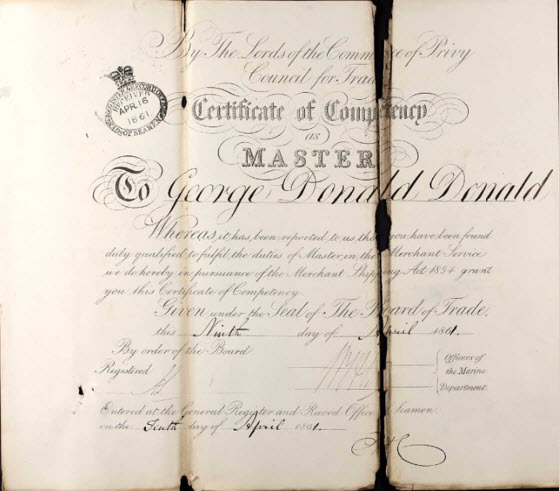 The first mate and second-in-command of the ill-fated ship was one George Donald Donald. 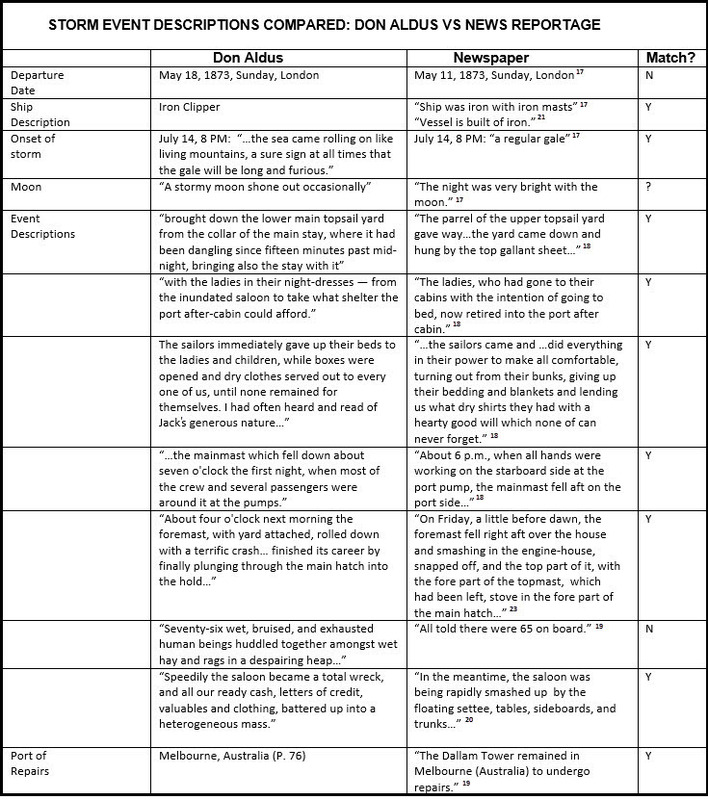 The following table picks selected elements from Mr. D’s descriptions and compares them to statements found in newspaper reports of the Dallam Tower disaster. 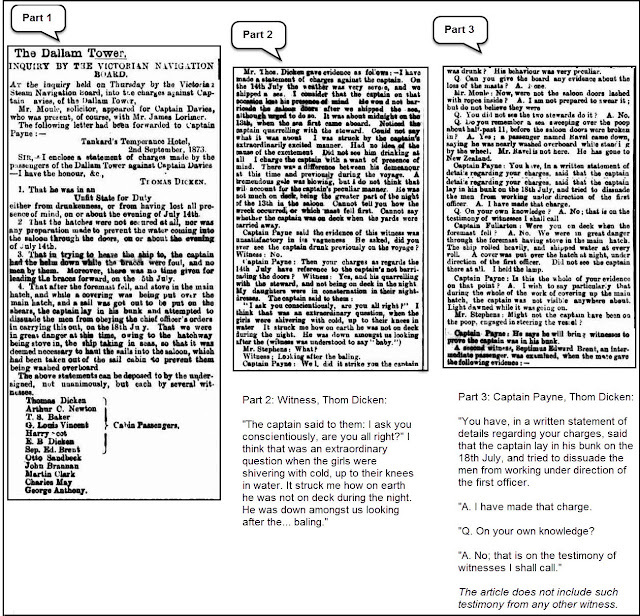 Figure 17: Selected events described in the books, "Coolie Traffic and Kidnapping" and "Don Aldus, The Rover," and corresponding descriptions of Dallam Tower shipwreck events drawn from newspaper reports and other contemporary sources. The parallels between Mr. D’s story and news reports regarding the Dallam Tower disaster are clear and persuasive. The story is the same. The Dallam Tower story proved to be a sort of Rosetta Stone. Figure 18: Display advertisement in The Times of London, on May 3, 1873. 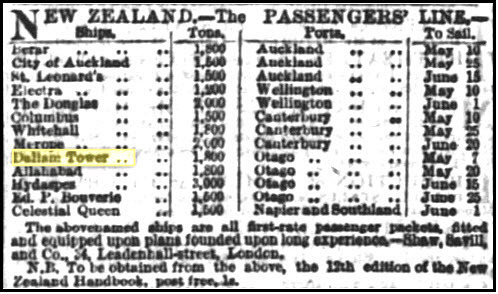 It lists the scheduled departure date of the iron clipper, Dallam Tower, traveling from London to Otago, New Zealand. However intriguing the newspaper reports that correspond to Mr. D’s tale of disaster, the details that he omits are far more telling. The first of many twists in this story is provided by what the narrator doesn’t share. –George Donald Donald, was publicly heralded as the Dallam Tower’s savior by many of its passengers. In our own age of self-aggrandizement, it is shocking to find an author suppressing facts that might otherwise have assured him of recognition and increased sales. A) Foremast. B) Mainmast. C) Mizzenmast. 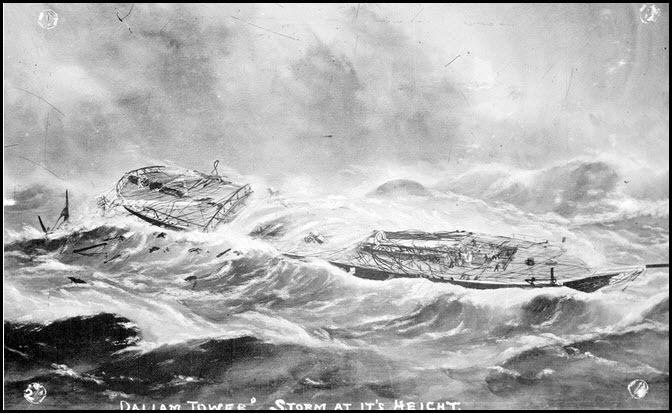 Figure 20: Illustration of the Dallam Tower having lost all three of its masts. This letter identifies George Donald Donald as a hero. Surely, the captain of the Dallam Tower, John S. Davies, would have noted the glaring absence of his own name! This omission must have amounted to a very public affront. Mr. D also fails to mention that some survivors of the Dallam Tower took yet another step. –Multiple Dallam Tower passengers presented a neglect of duty claim against the Dallam Tower captain to the Victorian Steam Navigation Board. (Melbourne, Australia, is in the Australian state of Victoria.) Figures 21 - 23, below, display newspaper reports of the official inquiry. 3. That in trying to heave the ship to (turn it), the captain had the helm down and the braces were fouled and unattended. No time was allowed for clearing the fouled braces. 4. On the last day of the storm, while the main hatch was smashed in, the captain stayed in his bunk and tried to dissuade sailors from obeying the orders of the chief officer. Had the hatch been left open, seawater might have flooded the ship with potentially disastrous circumstances. Captain Payne: From the 14th to the 18th, taking all the circumstances into consideration, did Captain Davies not do all that a captain should have done? 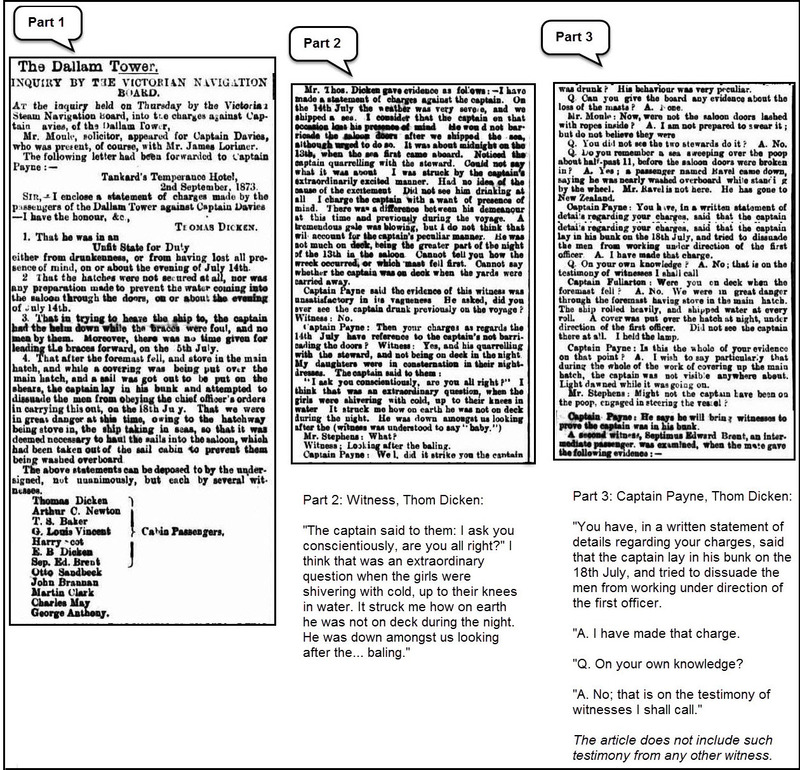 Figure 21: Portions of an Evening News (Sydney, Australia), article dated September 9, 1873.
of the testimony of chief officer, George Donald Donald (labeled Parts 4-6). Is it any wonder, then, that the survivors thought that George Donald Donald had saved their lives? Figure 22: Additional portions of an Evening News (Sydney, Australia), article dated September 9, 1873. The article reports on the official Victorian Steam Navigation Board inquiry into charges filed against Captain Davies of the Dallam Tower. 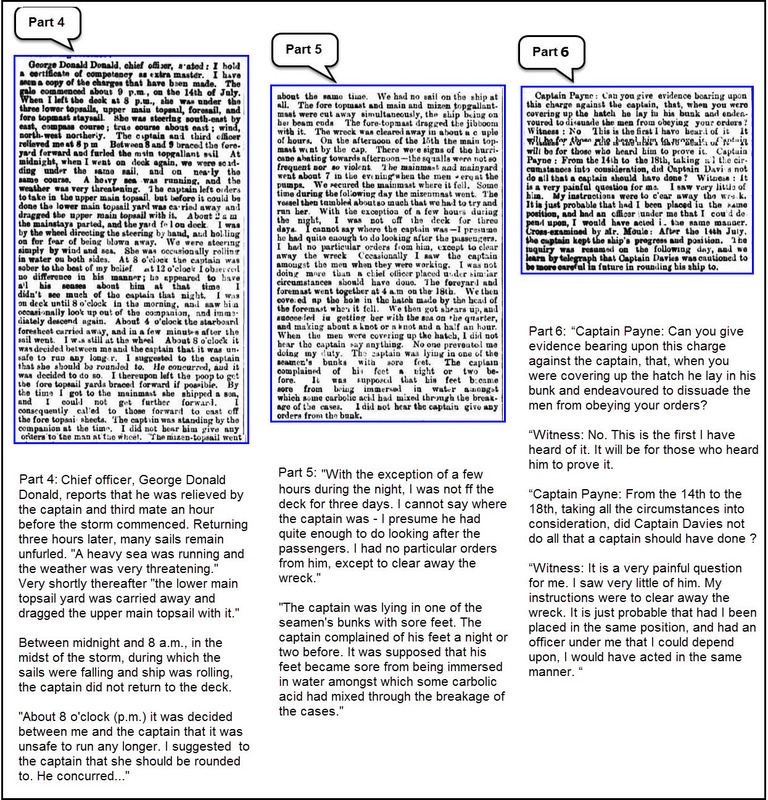 Parts 4-6 display portions of the testimony of chief officer, George Donald Donald. The Argus article of September 6th (See Figure 23, Part 2) suggests that the first mate’s testimony was key to this conclusion. 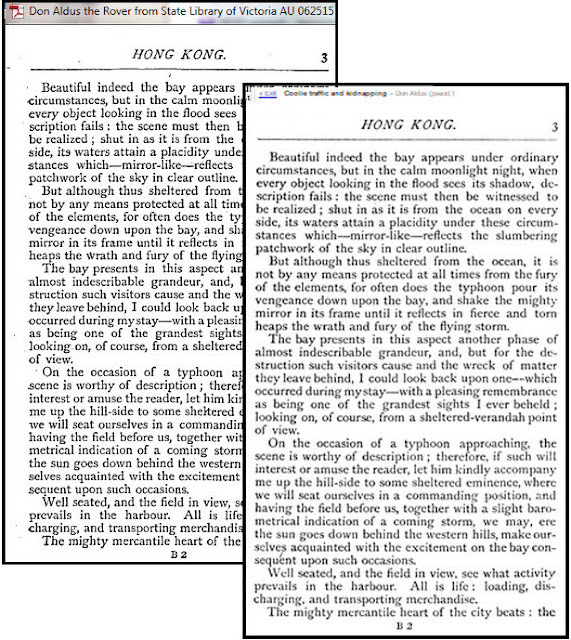 Figure 23: Portions of an article from The Argus (Melbourne, Australia) dated September 6, 1873. The article reports on the testimony to and the decision of the official Victorian Steam Navigation Board regarding charges filed against Captain Davies of the Dallam Tower by some passengers. In this article, Part 1 lists the charges. 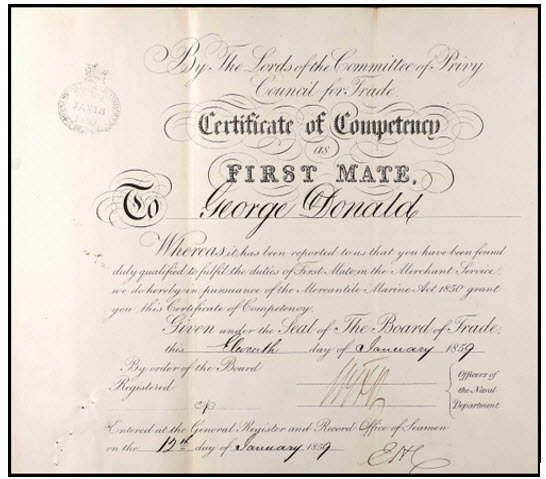 Part 2 shows that George Donald Donald’s testimony played a key role in the decision of the board. Part 3 reports that Captain Davies was found culpable. However, the board only issued a “caution,” a relatively minor form of censure. Nor is that all. Mr. D also passed over Captain Davies’ attempt to vindicate - or perhaps avenge - himself at the expense of his first mate. Seven weeks later, Captain Davies charged George Donald Donald, with willful disobedience of a command. The ship’s third officer “on being examined, admitted that the captain had told him not to take any notice of the (first) mate’s orders.” This is, by the way, the same invidious conduct described in the Dallam Tower passengers’ fourth charge against Captain Davies. That charge had been dismissed for want of first-hand confirmation. When Mr. D described the nameless captain of his disaster narrative as “the most wretched specimen of incompetent imbecility possible to be found,” was he being kind? This would be the end of the Dallam Tower story for the purposes of this essay were it not for the fact that the drama of the Dallam Tower disaster captured the imagination of succeeding generations as only a few stories ever do. Oddly enough, however, those who chronicled the story repeatedly misreported the name of the Dallam Tower’s chief officer. In 1924, 51 years after the Dallam Tower arrived in Melbourne, Sir Henry Brett, author and publisher, published a dramatic description of the same events in his book, "White Wings. Volume I". Brett shared his motive for revisiting the story in a preface. The court suspended Davies' captain’s certificate for three years. 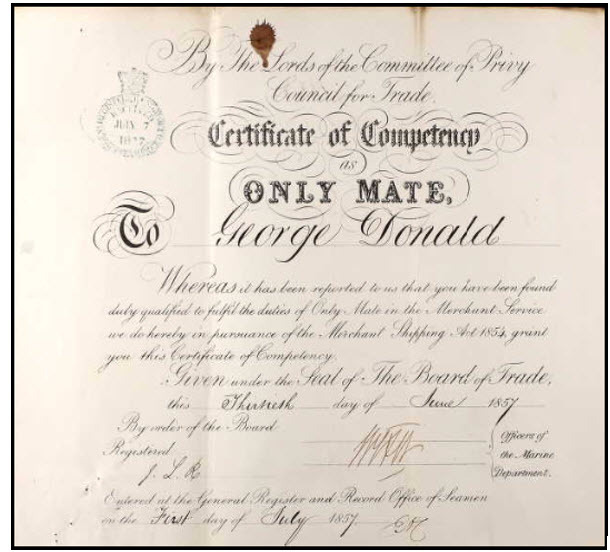 George Donald Donald’s high opinion of himself was implicitly confirmed by the 1877 court of inquiry. It held the first mate equally responsible for the wreck. Had Captain Davies’ first mate on the Queen Bee proven as capable as the first mate of the Dallam Tower, perhaps the second wreck might have been averted. –Demonstrated extraordinary modesty–reticence, really–regarding his own heroic efforts to save the Dallam Tower. –Sacrificed his credibility as a reporter of "facts" by delivering a completely fabricated image of himself and his status while on the Dallam Tower. –Completely rewritten the sequence of events to suit his needs. The preceding assertion only became evident after it was possible to identify and date the Dallam Tower disaster. Per the books’ narrative, Mr. D gave his version of the story in Macau, in 1866. (We discover signs of mutiny amongst the Coolies. Page 95). Mr. D described events from his own past that would not take place until 1873. A second date sequence discrepancy confirms that the first was no simple mistake. Later in the narrative, Mr. D, now well on his way to Peru, tells Mr. N about a different voyage he had taken through the Mediterranean (My voyage through the Mediterranean. Page 143). During that trip, Mr. D had visited Greece and seen its young, Russian-born queen. But, since she did not marry George I, the King of the Hellenes, until the following year, in October 1867, we have caught our narrator living in the future, yet again. Perhaps the promised “collection of facts suited to the time,” described in the Preface of "Coolie Traffic and Kidnapping" (See Figure 8) was not meant to imply that the whole narrative was entirely true. After all, again and again, throughout the text, the author highlights the truth of individual incidents, just not all of them. A page later, Mr. D. reconfirms the veracity of the anecdotes just shared and stresses the reliability of those to come. Mr. D is, in effect, tagging narrative elements for his readers. When he writes that one part or another is true, he implies that other, untagged narrative elements are not - entirely - true. The story of his Mediterranean cruise is true and reliable (even if the time sequence is not). The “varying incidents” of his voyage to Peru, he says, will also be true. 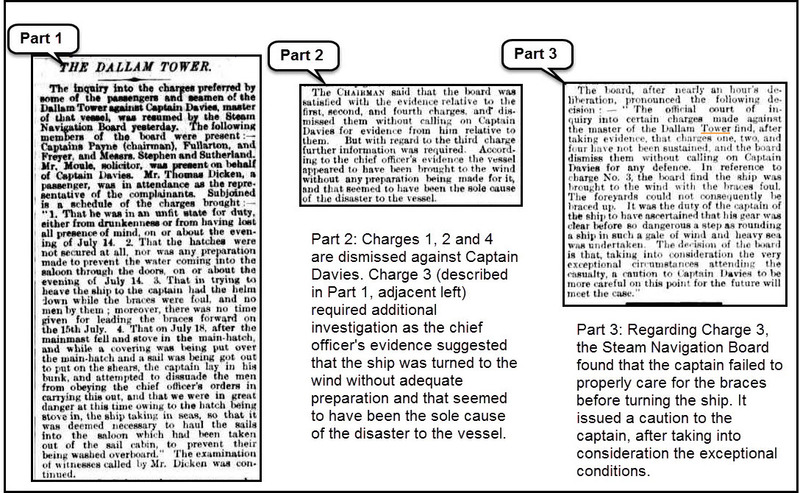 That insight prompted another review of the Mr. D’s Dallam Tower disaster story. 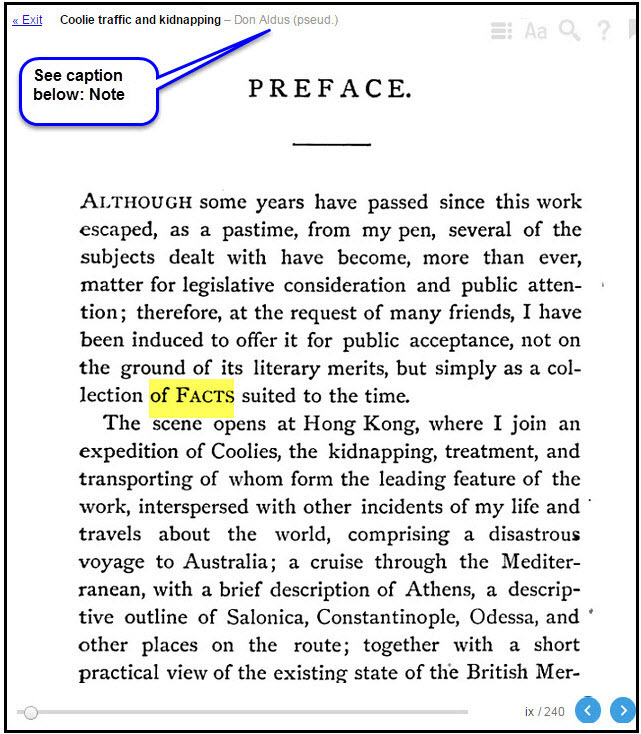 He did not describe it as “true.” Still, as shown in Figure 17, much of Mr. D’s version corresponds closely to the facts reported at the time in the press. A strict, legalistic reading of Mr. D’s assurance at the outset of "We arrive at Anger" (cited above) compels the conclusion that the veracity of the role and identity of the narrator, himself, have not been guaranteed. We have only been advised that the “incidents” are true, not the rest of the narrative. Thus are differences between “principle” and practice, in life as in literature, bridged. On arrival in Peru, Mr. D found that the involuntary contractors he traveled with were keenly needed. However satisfying that result might have been to the owners of the ship and the owners of the contracts, respectively, the “cargo” was not thrilled. The apparent anxiety exhibited by the Chinese prior to disembarkation (and distribution) was, as Mr. D saw the situation, utterly unnecessary. The worst was over. The narrator needed only this single paragraph to describe his two-month stay in Peru. 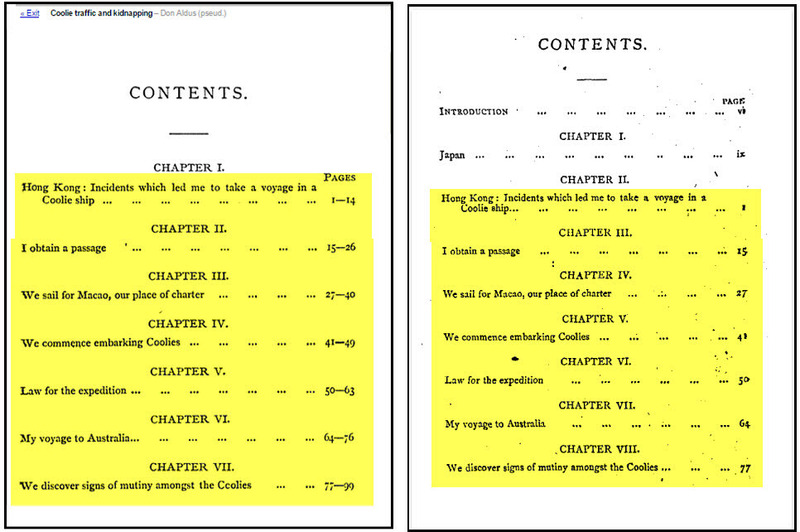 (By comparison, he dedicated 210 pages to the 3.5 month voyage that preceded it.) Mr. D’s penchant for touring the countries he visited (such as Japan and Greece) suggests that he would have done the same in Peru. Presumably, then, his relatively positive conclusion reflected significant personal experience. There were, in fact, many reports in the press of that period describing the dismal situation of indentured Chinese laborers in Peru and elsewhere. A July 26, 1869 article in The New York Herald, "The Chinese Labor Question." addressed the issue forthrightly. In October of the following year, The New York Herald published a second article addressing the issues associated with Chinese emigration entitled, “That Heathen Chinee.” It reports mortality rates that amount to slaughter. "Statements, not very trustworthy, however have come to the author from Havana (Cuba) declaring that there were less than 74,000 coolies on that island January 1, 1870. He cannot readily accept this account, because it does not seem possible that so large a proportion as one-half have died since their arrival." 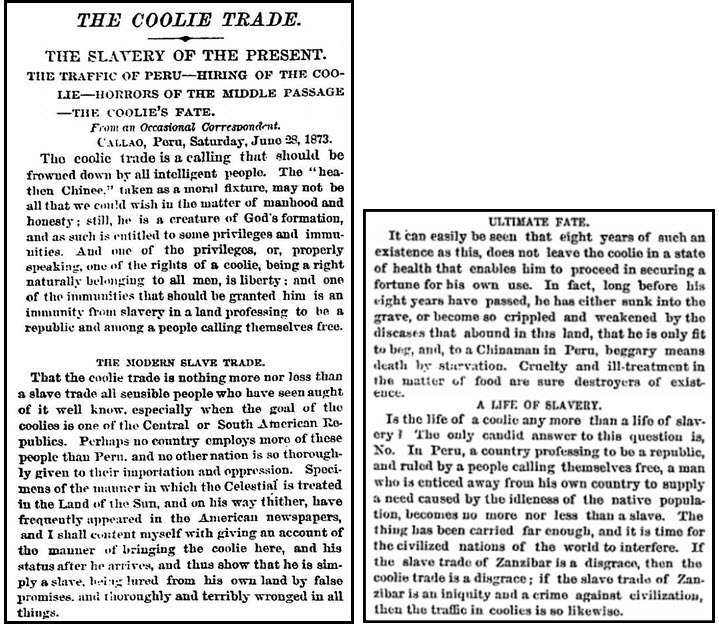 The subtitle of a July 1873 New York Times article, The Coolie Trade, by itself suggests the status of Chinese expatriates in Peru: The Slavery Of The Present. 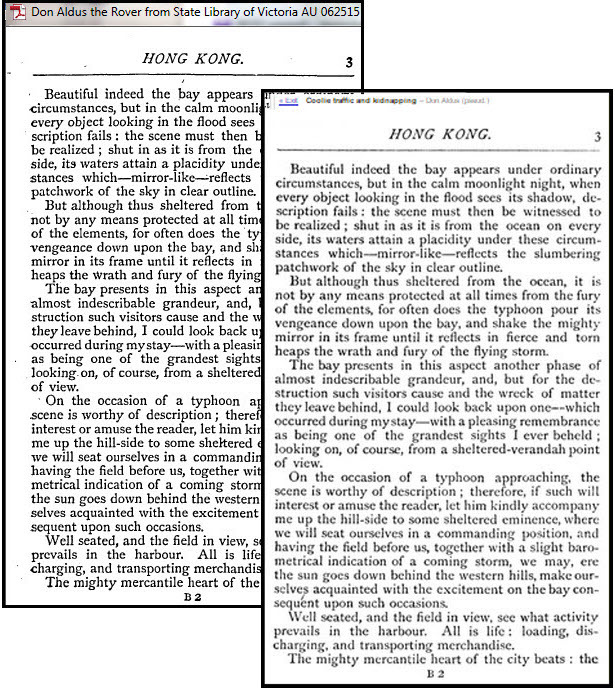 Figure 25: Portions of an article from the New York Times. July 19, 1873. As noted earlier, "Coolie Traffic and Kidnapping" was most likely written during or just after the period described in the New York Herald and New York Times articles. Surely the murderous conditions in which indentured Chinese then worked in Peru ought to have made a strong impression on the worldly, sensitive Mr. D.
It is particularly noteworthy that the lot of the Chinese working on the infamous Chincas Islands, also called the “guano islands,” goes unmentioned by Mr. D. As noted earlier, the mortality rate for Chinese laborers on these islands during the 1860s and 1870s was estimated at over 50 percent. According to the New York Herald article, “That Heathen Chinee.,” Chinese citizens, having generally concluded that the “work abroad” opportunities on offer were not worth the risk, had to be recruited by other means. "Then began the system of kidnapping coolies, purchasing, chaining, starving, and, as it may appropriately be called, murdering, which for twenty years shocked the feelings of all human persons and cast a dark blot upon the Portuguese and Spanish escutcheons that can never be expunged. Fathers and mothers sold their sons. ... Banditti brought in their male and female prisoners and sold them in lots to the traders, for which sums never exceeding ten dollars per person were thankfully received. "The traders organized bands of night thieves whose business it was to steal into cabins of the laborers and carry on board the ship the father and sons, and sometimes the whole family. ... Then ships ... were ... sent up the bay's and rivers to fall suddenly upon the unsuspecting inhabitants of some rural district. ... Old men were seized in the rice fields, boys in the schoolrooms, young men in the shops, and carried by force to the suffocating holds of the vessels at Macaow. Yet this dreadful traffic in coolies still goes on. Could money have had anything to do with George Donald Donald’s reluctance to fully report on the Chinese laborers' experience in Peru? After all, Mr. D never mentions the value proposition represented by the ship’s cargo. The omission is noteworthy. The Charleston Daily News article cited immediately above, also reports on the profitability of the coolie trade. A year earlier, a report in The New York Herald of July 26, 1969, described a similar price range, under a sub-section of the article, The Chinese Labor Question, entitled Cost and Profit. Mr. D travelled to Peru on a ship “fitted up” for “about 700” coolies. 44 The values reported by the Charleston Daily News suggest his voyage could have generated a gross profit of roughly $140,000. The same article put the cost of feeding a single coolie for a three-month voyage at $8 to $10, total. A modern historian calculated the net profit of an average coolie ship of the period. So Donald probably misrepresented his status on the coolie ship, too. Why would a sailor with the highest certification available in the English merchant marine fleet - Extra Master - sacrifice 3.5 months of income to play the role of a curious tourist with a hankering for a slave ship adventure? 47, 48 Especially, when he could make the same trip pay? Still, proof that Captain George Donald Donald was the captain of the coolie ship - a slave ship - featured in either "Coolie Traffic and Kidnapping" or “Don Aldus, the Rover,” or any other, for that matter, is not available. In the course of research, the cloud of mystery that surrounded Don Aldus lifted to reveal a more nuanced yet incomplete picture of George Donald Donald. age 45, husband of Mary A. G. Donald. Donald seems to have switched careers; he is now a commercial traveler, a traveling sugar salesman. Whitton Road Twickenham.” Inserts display the “D” and “my” found in the text. Do we have the right George D. Donald? Curiously, the man compelled to count every word in his masterpiece, was, at least in his later years, given to misspelling simple words and identifying the misspelled portion with an underline. Donald’s will provides two examples. found in this text. Compare them to those in Figure 30. Can we be sure that the captain wrote his own “last will and testement?” Compare the capital cursive D’s in the will to the capital cursive D in the (Don Aldus) journal inscription at left (Figure 28). They are virtually identical. For that matter, the cursive D in the signature that appears beneath the drawing of Don Aldus (Figure 14) is a close match for the cursive capital D’s in the will and in the journal inscription. In the will, the word “my” appears twice in the second sentence. Captain Donald’s approach to a cursive y, in both cases, resembles a cursive z. The journal inscription features the very same styling. Note the forward leaning slant of both texts. The same hand surely wrote them all. 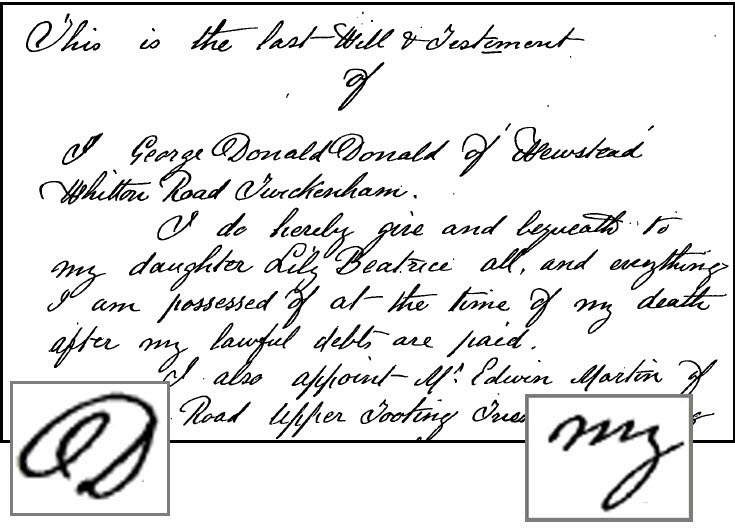 Figure 29: Detail from the handwritten “Last Will and Testement of George Donald Donald of Newstead Whitton Road Twickenham.”(Highlights added for emphasis). This pattern is (inconsistently) duplicated in the (Don Aldus) journal. In Figure 30, for example, “Superencumbant” is underlined. So is “Spectaclle.” But other underlined words are spelled correctly, such as “Staircase”. None of the words misspelled in the will or in the journal are also misspelled in the captain’s books. The closer you look at this, the odder it gets. In order to create the alphabetical compilation of words used in his book, the captain had to reference the book, itself. That might explain why certain words - words used only once or twice in the entire text, but in close proximity to each other - appear listed on the same page of the journal. Sanguinary and Superincumbent both appear only once, on page 132, in the text(s). Spectacle is used six times, and appears on pages 130 and 134. Sewn is only used once and appears on page 133. Syra, on the other hand, appears just once, too, but on page 146. Donald must have flipped through his book to identify words for inclusion in his alphabetical lists. But if so, how could he have misspelled words that are spelled correctly in his published book? Perhaps he used an uncorrected manuscript for this purpose. Spelling errors in the manuscript would have been transferred to his journal. But why would Donald use an uncorrected manuscript when a published version – with correct spellings - was available in the form of CR&K? Clearly, someone helped Donald correct the numerous misspellings. He had some sort of editorial support, after all. The world described in the pages of Coolie Traffic and Kidnapping and Don Aldus The Rover is almost unrelievedly dismal. Feigning friendly camaraderie, Chinese kidnappers lured both their high- and low-born Chinese prey into handsome facilities with drinks and offers of hospitality, from which only the kidnappers will exit with their liberty plus a handsome finder’s fee. Once trapped inside such a “barracoon,” threats and various levels of abuse invariably convinced the captives that any fate was preferable to an extended stay. They accepted new names and agreed to acknowledge that they had “voluntarily” accepted contracts abroad when examined by a government inspector. This farce was standard procedure in Macau, under Portuguese stewardship. When we first meet Mr. D, the tour guide embedded within the text(s), his understanding of coolie trafficking is credibly naive.
" ‘Well, sir, I believe there is some such farce as you refer to gone through ; but I am assured upon reliable authority that two-thirds of the poor things are decoyed from home and sold into the ‘barracoons,' after getting inside the gates of which the curtain drops over the victims.’"
"’Truly,’ said the doctor; ‘and the inquisitive eyes of the world fail to discover the coercive enormities committed within.’"
After a short trip from Hong Kong, Mr. D reaches Macau aboard the clipper ship that will be refitted to carry slaves to Peru. While there, he visits one of the notorious buildings - a “barracoon” - used to trap and hold those who will shortly be sold into slavery. His tour guide is a "friend." “On Saturday morning a friend conducted me through one of the barracoons, which I found to be a large, commodious, county-jail-looking structure. The “voluntary" laborers came aboard the ship not as passengers but as merchandize. The ship was fitted out as a floating prison. This was all perfectly legal as long as the ship sailed under the proper flag. (Note: Merchant ships then, as today, were subject to the rules of the country they are registered in. The “flag” of the country of registration determines what laws apply on the ship and whether those laws are enforced.) More to the point, it was necessary. Captain Donald’s book(s) are presented, fundamentally, as a report on and protest against the abduction and enslavement of Chinese citizens of the period (1860 - 1890). Yet, as described, there is strong reason to believe that the author’s first-hand knowledge of the “coolie trade,” as it was widely called at the time, reflects his active participation in the business. –fall victim to the hypocrisy implicit in the author’s unwillingness to reveal a true picture of the events, people and places he purports to have observed. This seems especially odd and inappropriate given the many newspaper articles of the period that reported on the abusive treatment of coolies in Peru, at least. Is it possible that the author was unaware of the many newspaper articles of the period that discussed the very practices he described or omitted? Of course. Nonetheless, in the court of literary license, ignorance of “current” affairs pertinent to one’s primary theme is not an acceptable excuse. This may explain, in part, why neither "Coolie Traffic and Kidnapping" nor “Don Aldus, the Rover” seem to have made much of an impression on the culture of the time nor resonated with their readers. 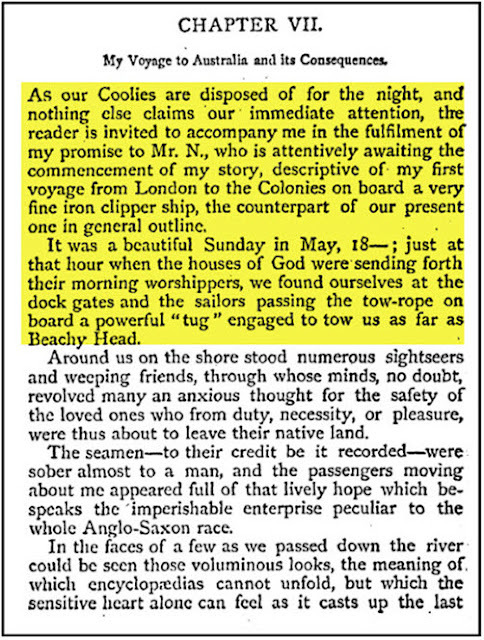 So, to cite yet another example, The Times (of London), published a description of the nauseating abuse of coolies on board ships headed to Peru, in its July 29, 1871 issue, page 9. This occurred five years before the publication of "Coolie Traffic and Kidnapping" (in 1876). The following is an excerpt. “A series of documents lately laid before the House of Commons reveals the existence in the Southern Pacific of horrors rivalling those presented by the African Slave Trade in its worst phases. It appears that there is a constant traffic between certain European ports in China and the Western coast of South America in Chinese Coolies, nominally shipped as voluntary and indentured labourers, but really as helpless and as subject to brutal treatment as any slaves. Peru has especially resorted to this source of labour supply, and since the abolition of slavery in that Republic, sixteen years ago, many thousands of Coolies have been imported from China. Figure 32: Two illustrations from "Don Aldus, The Rover." But, then again, if the stated objective was the delivery of able-bodied slaves to a far distant location for profit, optimization of the conditions of confinement is as logical as it is essential. Is there any form of mass transport to a gulag, concentration camp, or forced labor camp that would not benefit from such an approach? Still, Mr. D’s description of the then common approach to floating imprisonment makes the regime instituted in the American-built ship he took to Peru (involving frequent cat-o-nine-tail lashings replete with blood gushing backs and nearly dead victims) a dramatic improvement. “I have visited, not one but, several such ‘coal scuttles,’ on board of which I dare not embark my sow, where the 'Cruelty to Animals Act' might be in force; knowing this fact, dear reader, you will cease to wonder at the frequent mutinies of Coolies, but will ask those tender-hearted white men, dealers in human bones, why they charter such miserable rafts of rottenness and stench to carry the highest order of animal yet discovered. Despite their many faults, these books are artifacts of the period and windows into the minds of those involved in the coolie trade. Donald delivered ample evidence of a wounded conscience. He tried to share what he had seen and perhaps what he had done. The product of a twisted culture gave us these twisted tales. It is hard to overlook the fact that Donald refused to insert himself into "Don Aldus, The Rover," even though he published his first book under his own name. Why? Is it possible that he thought the illustrated version might succeed as a fictional narrative where the first version failed as non-fiction? Retaining the original text must surely have reduced the cost of republishing to a relative pittance. Earlier, I suggested that certain identification of the participants in the slave trade might have been subject to prosecution under British law. It is also possible that English libel laws of the period might have given the author pause. Other, earlier cases would likely have been known either to the author or to his publisher, who would also have been at some risk. Aside from any possible fear of possible legal repercussions, Donald must have felt sufficient shame over his personal involvement in the coolie trade or other activities that he felt obliged to misrepresent the awful treatment of Chinese workers in Peru. Only shame, it seems to me, would explain why an otherwise careful observer of the human trafficking trade would boldly assert that abducted coolies were better off in Peru than in their own home country–when the world already knew the truth. So far as I can tell, no one else has yet remarked upon or closely examined the issues raised by "Coolie Traffic and Kidnapping" and "Don Aldus, The Rover." This shouldn't be surprising as their authors and content are mere footnotes in world history. But what telling, troubling and provocative footnotes they are! Cover Art by Glenn S. Michaels. 2015. 8. Coolie Traffic and Kidnapping, by Don Aldus, 1873, McCorquodale & Co., Ltd. “The Armoury” See: https://archive.org/stream/coolietraffican00aldgoog/coolietraffican00aldugoog_djvu.txt. "Hypergraphia: The driving compulsion to write; the overwhelming urge to write. Hypergraphia may compel someone to keep a voluminous journal, to jot off frequent letters to the editor, to write on toilet paper if nothing else is available, and perhaps even to compile a dictionary. Hypergraphia is the opposite of writer's block." 13. Don Aldus, The Rover, By Capt. Geo. D. Donald; Chapter 1: Japan, Page xiii. "Next to the Indian Palanquin, recommend me to the Jinrikisha of Japan for ease and comfort..." On page xii, the author expounds upon the birthplace and significance of "Siddartha Gautama ('The Holy')" aka Buddha with a conversance that suggests personal experience of the area or a strong interest in religion and history. 15. GRAND DUCHESS OLGA CONSTANTINOVNA OF RUSSIA. Project Gutenberg Self-Publishing Press, World Public Library Association. Retrieved July 24, 2015, from: http://self.gutenberg.org/articles/Grand_Duchess_Olga_Constantinovna_of_Russia. Sourced from World Heritage Encyclopedia™ licensed under CC BY-SA 3.0. World Heritage Encyclopedia™ is a registered trademark of the World Public Library Association, a non-profit organization. 38. "Records uncovered by historians in the People's Republic of China, using Chinese records, reveal that from 1880 to 1885, a period when many of the coolies sent to Cuba and Peru during the height (also the last thrust) of the coolie trade in the first half of the 1870s would have completed their original contracts, only 1,887 of the Chinese managed to make their way back home to China. This was an insignificant number, given the over 100,000 who left China in 1870-74 alone for Cuba and Peru." 45. The actual number of Chinese citizens (coolies) on board is unclear. The author speaks of 700 in on pages 30 and 44 and 650 on page 124. As the new of crew members is reported at 56 (page 124), it is possible that some confusion resulted. 46. American Merchants and the Chinese Coolie Trade 1850-1880: Contrasting models of human trafficking to Peru and the United States. Schultz, Austin. Department of History seminar paper, Western Oregon University, 2011. Page 23, citing: Upton, James Henry. American involvement in the Chinese coolie trade 1848-1882. Thesis (M.A.) --Auburn University, 1970. Page 19. 49. Master mariner. Wikipedia.org. Retrieved July 20, 2015, from https://en.wikipedia.org/wiki/Master_mariner: “The Extra Master's qualification, which was discontinued in the 1990s, used to be the highest professional qualification and it was the pinnacle for any mariner to achieve.” This page was last modified on 7 November 2014, at 17:52. Original data: Scotland. 1861 Scotland Census. Reels 1-150. General Register Office for Scotland, Edinburgh, Scotland. The 1861 Census for Scotland was taken on the night of 7/8 April 1861. 57. 1901 England Census for George D Donald. Source Citation: Class: RG13; Piece: 1187; Folio: 117; Page: 20. : Ancestry.com. 1901 England Census [database on¬line]. Provo, UT, USA: Ancestry.com Operations Inc, 2005. 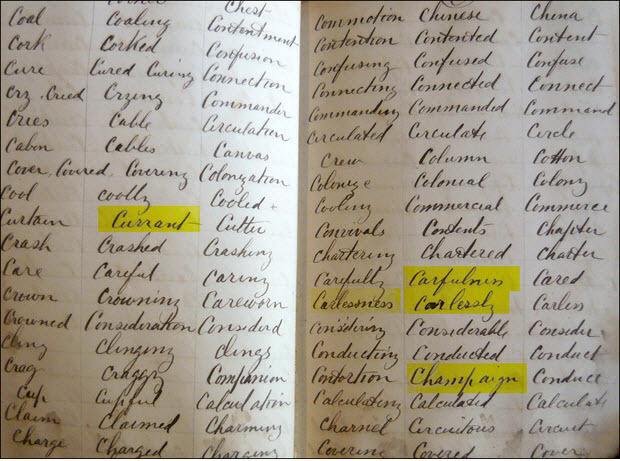 Original data: Census Returns of England and Wales, 1901. Kew, Surrey, England: The National Archives, 1901. Data imaged from the National Archives, London, England. Retrieved July 24, 2015, from: http://search.ancestry.com/cgi¬bin/sse.dll? indiv=1&db=uki1901&h=1772286. 61. The irony of the unintentional pun has not escaped the essayist. 63. James McNeill Whistler, Beyond the Myth, by Ronald Anderson & Anne Koval, Carroll & Graf Publishers, Inc. New York, 1994. Whistler v Ruskin; Pages 215 -227. A well written article. I look forward to following your ongoing research into this important and under-researched topic. I love you. But you're nuts!